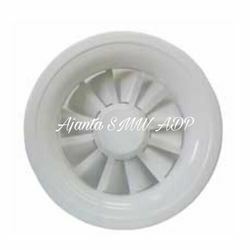 We are one of the well-distinguished companies in the market that are into providing HVAC Swirl Diffuser. Since 1997 manufacturing has been specializing in standard and made - to - order. Aluminum, M.S, G.S.S. stainless steel air distribution product for Industrial, commercial, residence.Today Ajanta designs, and manufacturing Damper Louvers, Risers, Terminal Box, Kitchen hood, Grills, Sound attenuator, Jet nozzles, spot diffuser, Swirl Diffuser in HVAC. System around the World, no other company offer a widest selection of these product. No matter how you measure it, Ajanta is number one in air movement and control. Ajanta believe our customer who trust us what we are. Ajanta has executed projects like Shopping Malls, Theaters, Offices, Air port, Hospitals, Hotels, Railways, etc. Ajanta privileged to work with consultants. As a Indian based company. Ajanta success in partially due of the regions well deserved reputation for quality workers who have unusually strong work ethic , from plant worker to senior employee are deeply committed to making continuous improvement in every thing the company does.Ajanta capacity and in house manufacturing assures. You that you are getting the highest quality product at the most competitive cost and a products that will last .